I first whipped up this interesting little gem of a recipe back in February, when we had just begun the modified elimination diet before going to see Dr. Vikki Petersen. I think the hardest foods to give up for the modified elimination diet were citrus and vinegar because that meant no condiments. No ketchup, no mustard, no salad dressing and no mayo. How in the world do you make chicken salad without mayo? 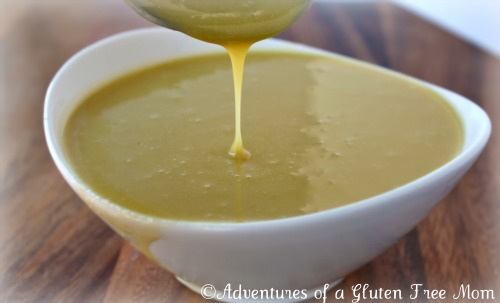 The inspiration for this sauce came from a recipe I made out of Shauna and Danny Ahern’s cookbook, Gluten-Free Girl and the Chef: A Love Story with 100 Tempting Recipes called Seared Shrimp with Garlic Almond Sauce, you can see a picture of it in this post. I first tried to make chicken salad with the Garlic Almond Sauce, but it just wasn’t “right” for chicken salad. After some experimentation, I finally landed on using macadamia nuts, with their light and buttery flavor. It worked so well that I felt as though I had struck gold (literally, the sauce is a beautiful golden color!). But first, I want to tell you about some of the health benefits of this salad. Did you know that macadamia nuts are a not only a good source of magnesium and potassium, but they’re also packed with copper, iron, vitamin B3, phosphorous, vitamin B1, zinc and vitamin E? 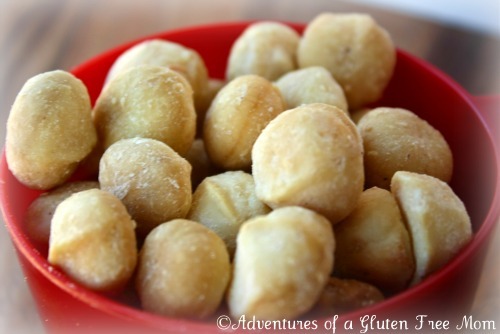 Macadamia nuts also provide monounsaturated fat and arginine, an essential amino acid. 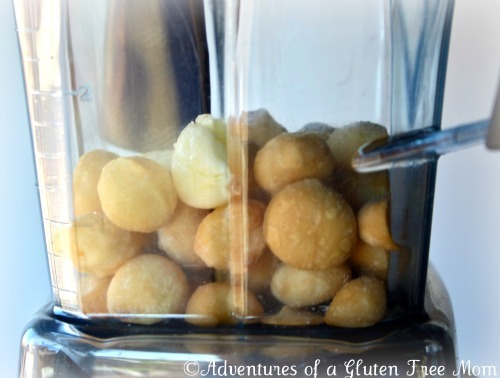 Some studies have even shown that macadamia nuts aid in lowering LDL cholesterol levels. Macadamia nut oil provides other significant health benefits. While olive and canola oil are the most common monounsaturated oils to use in cooking, macadamia nut oil is superior to cook with because of its lower level of polyunsaturated fat (3% for macadamia nut oil versus 8% for olive oil and 23% for canola oil). As a result, while olive oil and canola oil can form lipid peroxides at relatively low cooking temperatures, macadamia nut oil is stable at much higher temperatures (over two times more stable than olive oil and four times more stable than canola). Macadamia oil, like olive oil, is also very high in natural antioxidants. In fact, it contains more than 4.5 times the amount of vitamin E as olive oil. 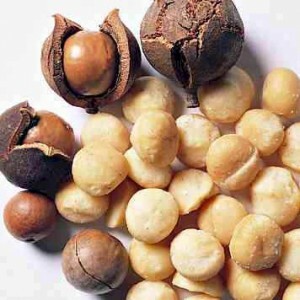 To read more about the macadamia nut’s amazing health benefits, check out this article. Another ingredient I add to my chicken salad are Eden Food’s Dried Montmorency Tart Cherries, which are not sweetened with cane sugar. Now, I like tart foods in general (I love to eat raw rhubarb..no added sugar, LOL! 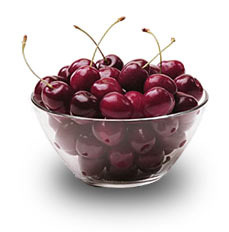 ), but there is something very special about Montmorency Tart Cherries! 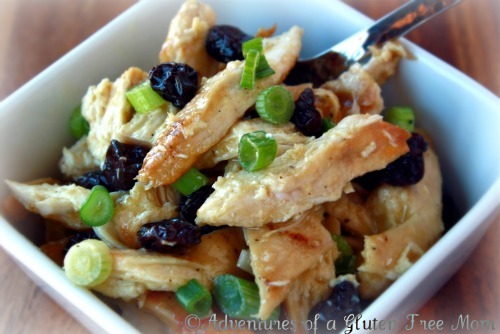 My chicken salad also contains garlic and scallions, which are some of the sulfur-rich foods that contain flavonoids which stimulate glutathione production. To learn more about glutathione, check out Dr. Mark Hyman’s excellent article, Glutathione: The Mother of all Antioxidants. 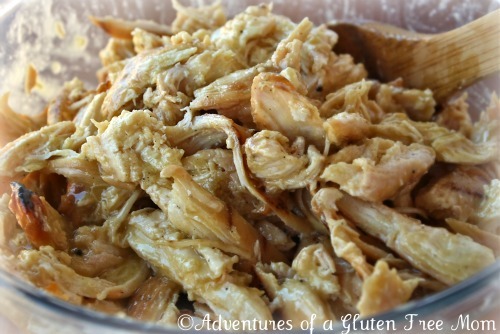 5 Boneless/Skinless Chicken Breasts, baked or grilled (I’ve been grilling my chicken lately, using Stubb’s 100% All Natural Texas Roadhouse Wood Chips and the smokiness adds an additional layer of flavor that is wonderful). 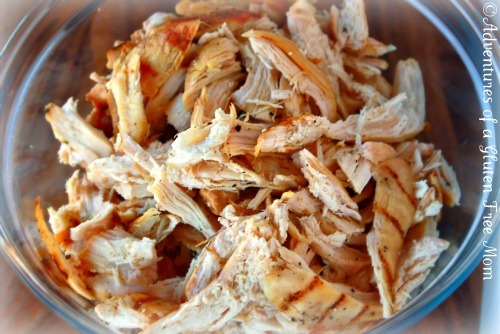 Shred chicken breasts (or chop into cubes), place in a large bowl. Add macadamia nut dressing, toss to combine. I recommend adding about half of the dressing, then taste to see if the salad is moist enough for your taste (I typically use 2/3 of the dressing). 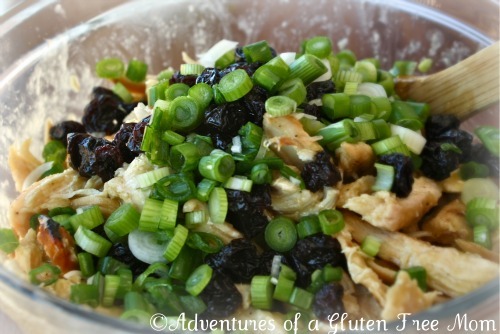 Add Dried Cherries and Scallions, mix to combine. Add more dressing if needed. 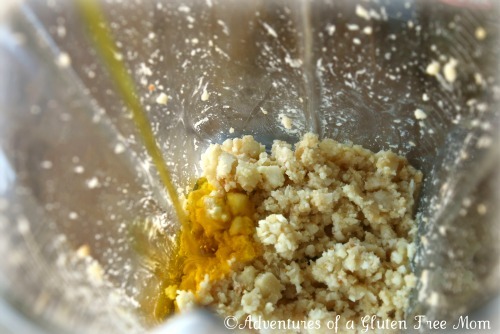 Add macadamia nuts, garlic cloves and salt to a blender* (see notes), blend until the nuts and garlic are finely chopped. 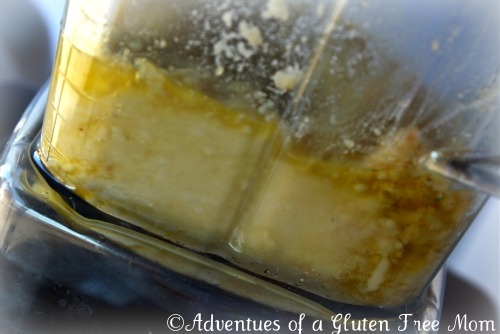 Slowly add all of the olive oil and continue to blend until the sauce is completely smooth and velvety. I’ve only made this in my Vitamix, but it might work in a regular blender (or a food processor) too. Just make sure to pulverize the nuts as much as possible. Mincing the garlic beforehand, may also be helpful. I make a TON of this salad and Mike and I each grab a bowl for lunch on most days (we like it that much). It’s a great salad to make a large batch of on Sundays, that way you can just grab some to pack in a lunchbox or simply snack on (really, it’s addictive). I made a large batch and took it to California with us back in February and it was an absolute godsend, since we couldn’t go to any restaurants. My sisters asked for a photo tutorial since they each have a brand new Vitamix and aren’t quite sure how to use it yet, LOL! 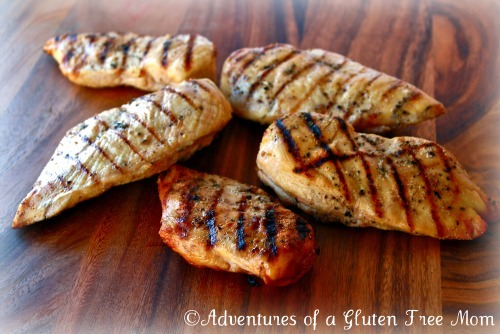 5 Grilled or Baked Chicken Breasts. I like to shred the chicken (but you could also cube it), set aside. 1 cup of Macadamia Nuts. Add Nuts to your blender (I used the wet blade container for the Vitamix), along with 2 Garlic Cloves and 1/2 tsp. Sea Salt. Pulverize the nut mixture until it looks like this. Until it looks like this, smooth and creamy. 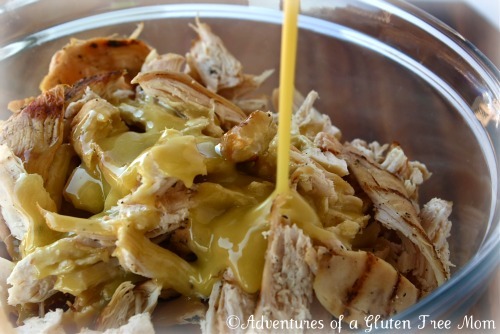 Pour 1/2 of the dressing over the chicken. 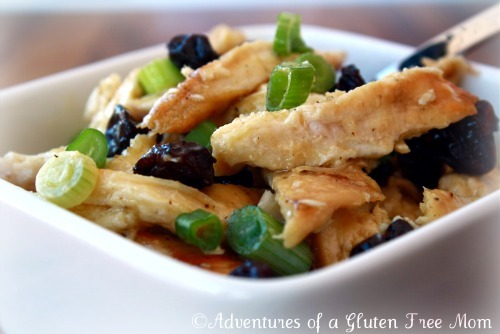 Add dried tart cherries and chopped scallions. Lastly, I would like to share and encourage you to read one of the most wonderful blog posts I’ve read in a long time. It’s on a very important topic for those in the gluten free community; the topic of mourning a lifestyle gone by, stage one on the journey to embracing a new lifestyle and the newfound health and joy that comes with it. My very dear friend (and gluten free super hero), Shirley Braden of Gluten Free Easily has written a post that I have long wanted to write, but somehow the words wouldn’t come. If you have ever felt the transition to a gluten free life is something akin to the Five Stages of Grief, this is EXACTLY the article you need to read: Grieving Gluten: The Five Stages of Loss of Gluten Plus a New One. I am very happy to say that after a few years of conflicting emotions and many episodes of deep anguish (plus a boatload of d.e.n.i.a.l. and a thousand hours on my shrink’s couch), I am now LOVING my gluten free life…and I would not give it up for anything. I love mayonnaise like Hugh Heffner loves blondes, but this looks AMAZING. I seriously love macadamia nuts and I would have never thought to make it into a dressing, let alone use it for a chicken salad. I am so gonna try this! I feel the same way about mayo and agree with you, it does look amazing! I've been hearing a lot about macadamia nut oil and the whole nut lately, this sounds perfect. I'll have to give the dressing a try. Thanks for sharing! You so have to make this salad, especially if you like contrasting flavors (think salted chocolate). 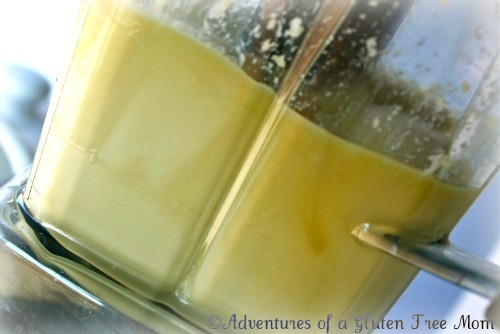 For those of us without the Vitamix (ahem), we might try it with macadamia nut oil. Any idea about how much liquid you're getting out of the macadamia nuts? They're pretty moist, but I know it won't be one cup. The whole macadamia nuts weren't used for the oil they contain, they were used to provide "body" to the dressing. I have been giving this some thought though (for people who are allergic to tree nuts) and I think this recipe would taste equally as well just using an oil (either olive oil or macadamia oil), plus the garlic and salt. This will still give the salad moisture and a lovely flavor. If you try it this way, please let me know how it turns out! The pictures of your dressing look AMAZING. I may try grinding them up without liquifying them (the texture would be different, but maybe good). I'll let you know how it turns out! Oh boy is right, LOL! Traveling is certainly easier if you are driving because you can pack a lot more necessities without fear of over-weight luggage! That being said, when we flew to California, I packed an entire suitcase with kitchen gadgets: my Vitamix, a collapsible colander, a saucepan, a skillet, a cutting board, one of my knives and a few wooden spoons (we stayed at a hotel with a kitchenette). I also packed a few dozen blueberry muffins since I didn't want to mess with baking (and we couldn't have cereal or other traditional breakfast foods at the time). This worked really well for our family of 4 since my little ones only took one suitcase each (and you are allowed 2 per person on Southwest). I also have two different backpack coolers: http://www.amazon.com/Picnic-Time-Insulated-Coole… and http://www.amazon.com/Picnic-Time-Insulated-Backp… and these were GREAT for packing cold stuff: lunches and snacks for the flight as well as this chicken salad. Once we arrived in Sunnyvale, we staked out the closest Whole Foods and stocked up on produce for our daily smoothies, as well as other food items for lunch and dinner. We also purchased disposable plates, utensils and cups, plus a couple cases of bottled water. A good place to find a house or apartment for rent is the web site http://www.VRBO.com (VRBO stands for Vacation Rentals By Owner). I've used it several times. Thank you very much for the informatio…and seeing that you are my dad, I absolutely trust your recommendation, LOL! I LOOOOOOOVE this chicken salad! I too love mayo, but this dressing blows mayo out of the water! I can't wait to get my vitamix, this is going to one of the first things I make for sure! Thanks for sharing sis! I was really excited when you and Gretchen reacted to this salad the way you did…I had been afraid to post the recipe before that (seeing that I can't taste much and I think Mike says he likes things just because he's afraid not to, LOL!). I stumbled across this recipe through another GF blog. I made it but had to modify just a bit because it didn't have enough macadamia nuts (plus they are really expensive). 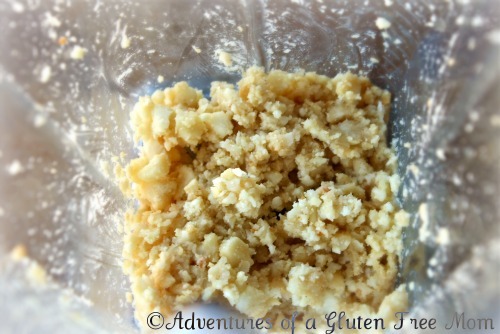 I use 1/2 c macadamia nuts and 1/2 c raw cashews (soaked for 2 hours). It is wonderfully creamy and still has the butter flavor of the macadamia nuts. Yum Yum! I can't believe you've already made this, you ROCK! 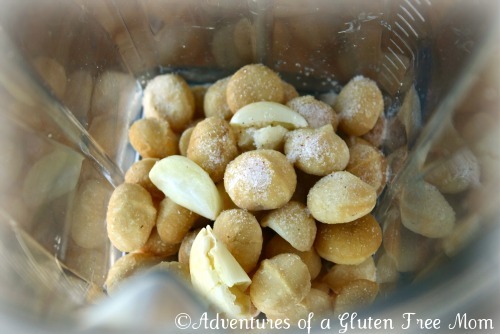 I will definitely be trying your modified recipe on my next batch, you're right…macadamia nuts are EXPENSIVE! (This is like the Kobe beef of chicken salad, LOL!). Oh wow! This sounds incredible! I usually use Greek yogurt, avocado, vinegar and seasonings to make chicken salad, but this is a must! Thanks for sharing this one! In addition, I am so happy that you have now adjust to the gluten-free life style. It fits you very well! Given lemons, you've certainly made lemonade! That. Looks. So. Good. Oh, how I wish we could have nuts! That looks incredibly good, Heidi! We're all about chicken salad in my house. I like this recipe because there's no soy like in traditiona OTC mayo! Great tutorial, dear, and a million thanks for linking to my latest post with such generous words. I'm so glad you have reached that "loving it" stage! OH, Heidi! Chicken salad is one of my favorite foods! I've always made it with mayo but this is awesome! I made it today and I used a smoked sea salt in it because I didn't grill the chicken. In my house the grill is "man zone" and my husband was busy reworking shelves in his bar so I baked the chicken. The smoked sea salt add just enough "grill flavor". But the dressing is just yummy! I'm thinking it'll be yummy on a pasta/veggie salad, too. Time to get more macadamia nuts! Thanks, Heidi! This chicken salad is AWSOME!!!!!! And it is fresh, not heavy like the chicken salad used with mayo. This is sure to be a favorite in our home 🙂 I don't know how you do it, but you rock my beautiful sister!!!!!!!! YUM YUM YUM!!! Made this yesterday and almost cried! I have not had Creamy Garlic dressing in years after going GF/CF etc… and this tastes JUST as good if not better then dairy/chemical based Creamy Garlic Dressing! I am THRILLED! Thanks SO MUCH for all you do! This by far is my FAVORITE recipe blog EVER! 🙂 Love your positive attitude as well! 🙂 THANKS AGAIN! I actually do NOT like mayo and am super-psyched to try this recipe. I can't believe I have ALL the ingredients at home right now. I'm making this tonight. Thank you! Heidi, I made this and didn't use all the sauce on my chicken so I took the left over sauce and used it instead of peanut sauce for a spicy peanut sauced noodle salad recipe I got from a friends ex-wife who grew up in Laos. Yummy! I just made this for dinner and my family LOVED it! This is such a great recipe!! I also added about1/4 c of water. Thanks so much for sharing this on Chowstalker Heidi!! I can't wait to try it,…sounds really delicious. Holy Moly, Heidi! I just made this and it is like the Big O on a plate! 🙂 I had to stop myself from eating it, SO delicious and SO healthy! You rock girlfriend! There you go again making me salivate. I also added about1/4 c of water. I stumbled across this recipe through another GF blog. Thank you so much for this recipe. I don't have gluten sensitivities. However, I don't love mayo and I really dislike the use of soybean oil and canola oil in commercial preparations. I went looking for a non-mayo chicken salad recipe and luckily came across this post. Macadamia nuts fit perfectly into my real food "primal" diet . YUM! Yumm! I have been looking for a healthier chicken salad alternative. This is perfect. Thank you! I made this over the weekend. I literally had a dream about it that night. It was fantastic. My daughter has taken it for school lunch for the last two days. Thanks for that great classic recipe! I will be making it many times in the future. Ok, crazy questions. I went to Whole Foods to get Macadamia nuts and all of their nuts say “made in same facility as wheat”. I’m not sure how safe they are and I have Celiac. What brand of nuts do you use? I’m also very afraid of buying them out of any bulk container due to CC issues. Who knew buying raw nuts would be so challenging?!! This Salad is really amazing! it looks so delicious, I guess I will have to try this at home! not. The internet is a wonderful resource for finding out some common sources of gluten.